Home dairying can be such a joy. Transforming a gallon of milk into a tasty cheddar, using up some bargain aisle cream to make butter, or culturing some milk with kefir grains and turning it into a probiotic rich smoothie. 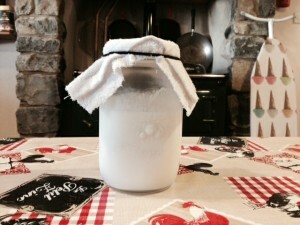 Although there are lots of sets of equipment you can buy to get you started, most home dairy can be made with very little and often just what you have in the normal kitchen. Yoghurt, kefir, and other loose milk cultures can be made with little more than a kilner jar and some patience. 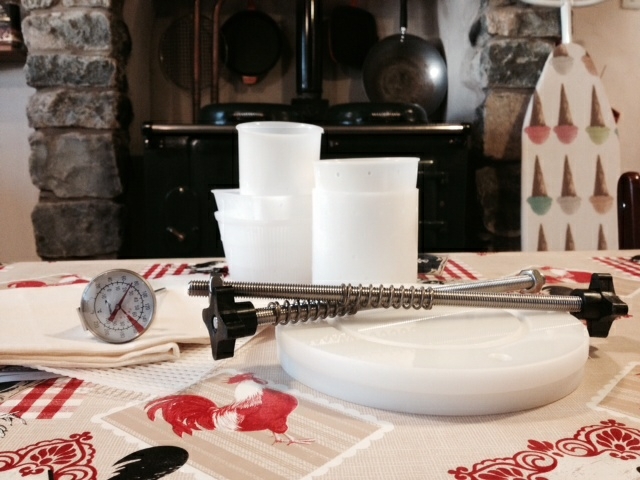 For soft cheese a cheesecloth is about all the extra equipment you will need. Hard cheeses do need a little more, but once you have bought the initial equipment you soon make your money back by being able to make a premium product on a pauper’s budget. Often in the supermarket’s bargain aisle there is reduced price cream or milk on the last day of its use-by date. Although they can be frozen and used as they come, you can also transform them into delicious home dairy. This extends the shelf life meaning you get a bargain and tasty home made food. I find that if I have some milk in the fridge that I can tell is about to turn sour, it can be turned into a tasty yoghurt or kefir. If I over culture my kefir it isn’t a loss to go in the bin, but a chance to make a delicious kefir soft cheese. And whey from the process is also fantastic for baking with, and actually helps make bread more digestible. Waste not want not! The best part of home dairying I find is being able to create your own recipes. Adding fruit puree to yoghurt or kefir and leaving for a second ferment creates a tasty treat, that isn’t packed full of sugars like the supermarket version. Cheeses can be flavoured in any way you like, Wild Garlic and Rosemary being one of my favourites. You’ll often find all sorts of added extras you don’t want in supermarket dairy – sugar in yoghurts or sulphites in flavoured soft cheese – so by making your own you are controlling the end product which is not only tastier, but healthier too. Cheddar cheese is a British staple. At the moment the lowest supermarket price (December 2015) comes in at £4.29 per kilo. If making your own with standard supermarket milk you would need roughly 10l of whole milk for 1kg cheddar which at current lowest prices is £0.45 per litre and works out at around £4.50 a kilo for milk alone. As you can see the supermarket price is a little lower for the pre-made basic cheddar, but the end product is far superior when made at home. Plus once you look at flavoured and premium cheddars, which is what your home dairy is on par with, you can’t get them for less than £8.50 per kilo, so home made cheese is a money saver in many ways. Kefir, viili, yoghurt, sour cream or creme fraiche are just a few of the many cultured and fermented milk products you can easily make in the kitchen. Sometimes these are hard to buy in the supermarket – such a viili or kefir – so making them at home is the only way to have a regular supply. With others such a yoghurt these can be bought easily at the supermarket, but the home made version is tastier and in the case of flavoured yoghurt a lot healthier than those that can be bought. Although making your own butter will often be more expensive than buying a block in the supermarket it enables you to flavour and salt to your own tastes and if there is cream in the reduced section it is worth picking up and having a go.